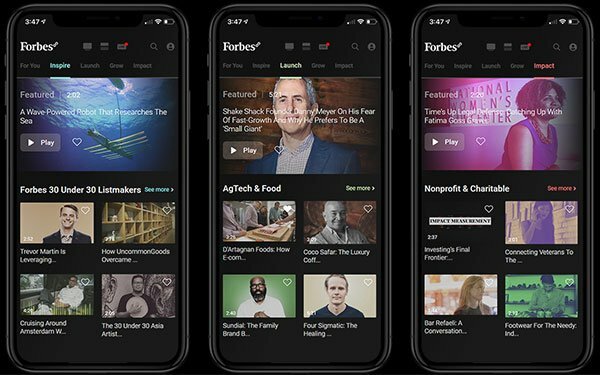 Forbesnhas created an over-the-top streaming video platform for entrepreneurs in partnership with global SaaS tech company AW3 Media. Called Forbes8, the platform features more than 2,000 pieces of content. It aims to serve as a resource for entrepreneurs, like a Netflix for budding business people. Forbes8 costs $8.99 a month in the U.S.
Forbes calls it a “purpose-built product,” with the goal of providing them with information, advice, tips and tools. “With more than 100 million new businesses expected to launch this year worldwide, there is a tremendous need for a business-advice on-demand network around the world. Forbes8 fills that void while also providing a sense of community with others on the same journey,” stated Forbes’ Chief Growth Officer Tom Davis. It is the first time Forbes has created a digital video network of this kind. AW3 Media, founded by Amos Winbush III, works with 15 telecom partners, including Busy, Bharti-Airtel, Etisalat and MTN. The company claims to reach 2.2 billion mobile phone subscribers spanning 150 countries across five continents. “My goal is to reach out to individuals on a global scale with really great ideas and turn them into action-oriented companies that not only inspire their local community, but can change the world,” Winbush told Publishers Daily. Winbush is an entrepreneur, having built several technology platforms that led to telecom partnerships. The “first channel” of Forbes8 subscribers will come from AW3’s relationship with those companies. The network is launching in Ghana, thanks to its partnership with BusyInternet, which is based in Accra, the capital. “BusyInternet and Ghanaian officials champion entrepreneurial efforts in their country, with a specific focus on igniting innovation there,” Davis told Publishers Daily. “This approach closely aligns with our mission here at Forbes." Ghana, Davis noted, serves as a gateway to West Africa. Content on Forbes8 is aimed at entrepreneurs at various stages in their businesses — from preparing to launch to building growth. It is categorized into four themes: Inspire, Launch, Grow and Impact. “Inspire” is for innovators, featuring video of various business icons and Forbes Under 30 list makers. “Launch,” features leaders in industries like agtech, education, energy, healthcare, infrastructure, manufacturing, retail and technology. “Grow” focuses on finance, marketing and operations advice. “Impact” spotlights philanthropy, social entrepreneurs and charitable efforts. Forbes8 will roll out new partners "in the coming months," he added. Forbes8 utilizes machine-learning and artificial intelligence to deliver a personalized experience on the platform. When a user signs up, they are asked a range of questions to determine what stage their business is in, and what type of content interests them. A “For You” section then creates custom playlists based on those preferences and needs. It continuously updates based on the user’s viewing behavior and search history. The platform is available on the Apple Store and Forbes8.com, as well as with the telecom partners working with AW3 Media.